World military expenditure was $1686 billion in 2016, an increase of 0.4 per cent in real terms. Total military spending accounted for 2.2 per cent of the global GDP in 2016. The five biggest spenders in 2016 were the USA, China, Russia, Saudi Arabia and India. Military expenditure increased in Asia and Oceania, Europe (Central, Eastern and Western) and North America. Military spending decreased in Africa, Central America and the Caribbean, and South America. 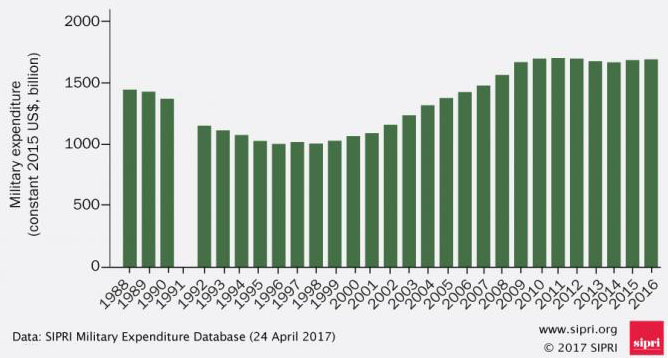 Of the countries in the Middle East for which data is available, total military expenditure fell by 17 per cent; the major decreases were in Iraq (–36 per cent) and Saudi Arabia (–30 per cent). Military expenditure in the USA grew by 1.7 per cent to $611 billion in 2016, the first increase after five consecutive years of decline. Despite this slight increase, US military spending remains 20 per cent lower than the peak of 2010. The fall and continued slump in world oil prices has had a substantial effect on military spending in a majority of oil-export dependent countries. In many cases (e.g. Saudi Arabia, South Sudan and Venezuela), country-specific cuts have been so substantial that they have affected regional and subregional spending trends. In many oil-exporting countries, increases in military spending over the past 10 years have been correlated with high oil prices. The subsequent fall in the price of oil has led to substantial decreases in military spending. Since late 2014, the sharp fall in oil prices and the persistent price slump have had a significant impact on spending in several oil-exporting countries. The decline in oil revenue has forced many oil-exporting countries to cut their government budgets, including military spending. The falls in countries such as Angola, Ecuador, Iraq, Mexico, Saudi Arabia, South Sudan and Venezuela have affected the wider regional trends. Note: The totals are based on the data on 172 states in the SIPRI Military Expenditure Database, . The absence of data for the Soviet Union in 1991 means that no total can be calculated for that year. This is the fourth installment of a five-part series that originally ran in May 2016 examining the measures that could be taken to inhibit North Korea's nuclear weapons program. The purpose of this series is not to consider political rhetoric or noninvasive means of coercion, such as sanctions. Rather, we are exploring the military options, however remote, that are open to the United States and its allies, and the expected response from Pyongyang. Part five can be found here. Laughter illuminated the life of the publisher Angelo Formìggini: It was, he asserted, “the foundation of solidarity between human beings”. He won a mass audience for the classics of satire, from Apuleius to Margherita d’Angoulême and Jonathan Swift. Formìggini’s contribution to the canon was his university thesis, The Woman in the Torah and the Manava Dharma Sastra, which argued that Aryans and Semites shared a common racial genesis — a text he cheerily admitted to fabricating. For Formìggini, who like many Italian Jews supported Benito Mussolini, seeing in fascism the prospect of a great national revival, communal identity was a prison. Even when the fascists passed racial laws stripping the Jews of their rights in 1938, he defended assimilation. “This is but a break, which will be more or less long,” Formìggini wrote, “after which the journey will resume”. Then, in November that year, in a desperate effort to evade the race laws, Formìggini jumped from Modena’s magnificent Ghirlandina. “He died just like a Jew,” National Fascist Party secretary, Achille Starace spat out, in the regime’s only comment on Formìggini’s suicide. “He threw himself out of a tower to save a gunshot”. Formìggini’s despairing suicide is a useful prism to contemplate the silence of India as it is confronted with the religious right’s apparently inexorable rise. The recent #NotInMyName protests will prove, more likely than not, a despairing lament for a dying secular order, rather than the kernel of a new politics. The remarkable feature of the ongoing communal violence in India is how much consent it enjoys: If there is public outrage, it has been remarkably slow to emerge from people’s front doors. 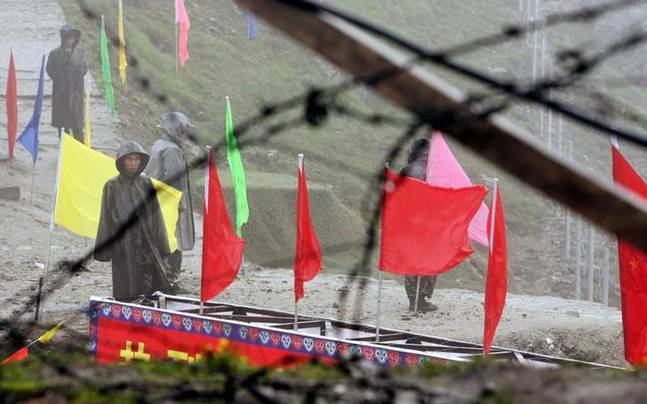 On the continuing stand-off in Doklam and the LoC firing between India and Pakistan, a Chinese strategic expert said that India was now dealing with 'two conflicts' at the same time and questioned Delhi's ability to handle both. With renewed firing along the Line of Control (LoC) between India and Pakistan, a Chinese strategic expert said on Monday it would be "unwise for India to engage in two conflicts at the same time". Pointing to the continuing stand-off in Doklam and the LoC firing, Lin Minwang, a strategic expert at the Institute for International Studies at Fudan University, told the Party-run Global Times, a tabloid known for its hawkish views, that India was now dealing with "two conflicts" at the same time and questioned Delhi's ability to handle both. "China has nothing to do with the situation in Kashmir, but it would be unwise for India to engage in two conflicts at the same time," Lin told the newspaper. A separate Sunday commentary in the same paper also linked the Kashmir issue to India's "intervening" in the Doklam dispute between China and Bhutan, saying it could set a precedent for "a third country's army" to intervene in Jammu and Kashmir. So far this year the violence is up 5-10 percent nationwide. Most of those killed are civilians, either caught in the crossfire or victims of violence by Islamic terrorists (mostly) Taliban or drug gang gunmen seeking to force locals to cooperate or at least stay out of the way. The Taliban (mostly) and drug gangs (who keep a low profile) suffer heavier losses than the security forces, largely because the outlaws are fighting each other as well as angry civilians and the unexpectedly (according to their leaders) army and police. All this violence is, unfortunately, not unusual for the region known to most as Afghanistan. For most people living here “Afghanistan” is a secondary name for where they live. The primary name relates more to tribe and very local geography. This whole nation thing was never widely accepted in this region and modern “Afghanistan” is something of a scam developed by many of the major tribes to deal with troublesome (and often heavily armed) foreigners. This time around the most dangerous foreign threat is chemical and financial. Heroin, made possible by a late 19 th century German chemical process enables locals to convert opium (laboriously obtained from poppy plants) into much more valuable (and portable) heroin. While a few Afghans benefit financially (some spectacularly) from the heroin trade nearly half the population in Afghanistan, Pakistan and Iran suffer the consequences of addiction, crime and social breakdown. The drugs are winning as they usually do wherever they get established. Eventually they get crushed but eventually can last a long time. The only thing that nearly everyone in Afghanistan can agree on is that the opium and heroin are bad. Nearly ten percent of the population is addicted to drugs (mostly opiates) and another ten percent (there is some overlap) makes a living or gets rich from the drug trade. Most Afghans consider the biggest threat to be the drug gangs, which are largely run and staffed (like the Taliban) by Pushtun. The Taliban want to create a heroin producing Islamic terrorist and gangster sanctuary in Central Asia. If you want to know how that works, look at Chechnya in the late 1990s and Somalia during the last decade. No one has come up with any cheap, fast or easy solution for that. Meanwhile, Afghanistan’s core problem is that there is no Afghanistan, merely a collection of tribes more concerned about tribal issues than anything else. Ten percent of the population, mostly living in the cities and often working with the foreigners, believes in Afghanistan the country. But beyond the city limits, it’s a very different Afghanistan that is currently motivated by growing prosperity brought on by a decade relative peace and the persistent “traditional” violence. By Afghan standards, an unprecedented amount of cash has come into the country since the end of 2001. Pakistan extends the Nasr’s range by 10 kilometers. Is that meaningful? Last week, as the world’s attention zeroed in on North Korea’s first-ever launch of an intercontinental ballistic missile, another Asian country tested a much shorter-range nuclear-capable system. On July 5, Pakistan carried out a flight test of its Nasr (Hatf-IX) short-range surface-to-surface ballistic missile. The Nasr is Pakistan’s delivery platform for low-yield nuclear weapons (sometimes called “tactical” nuclear weapons) and has been in development since the mid-2000s. The expected nuclear payload of the Nasr is estimated to be in the sub-kiloton range. The ISPR statement does not clarify if the improved maneuverability was demonstrated in the missile’s terminal stages or possibly involves some sort of terrain avoidance feature during flight. Historically, Iran and Pakistan enjoyed friendly relations. Iran was quick to reach out to the newly created Pakistan in 1947, and in its early decades, senior Pakistani leadership – including founding father Quaid-i-Azam Muhammad Ali Jinnah – mostly came from the Shia sect of Islam. So although Iran was then neither sectarian nor at the vanguard of Shia Islam, the two countries remained close in many respects. Mohammad Reza Pahlavi, the Shah of Iran, was the first head of a foreign country to visit Pakistan. Officially adopted in 1954, Pakistan’s national anthem, Alex Vatanka points out, is almost entirely written not in Urdu but in the Persian language. Meanwhile, Sunni Arab states, including Saudi Arabia, were themselves an underwhelming presence in those pre-oil years. Unsurprisingly, then, Pakistan saw its interests being served by close ties to Iran. The two countries were conspicuously cooperative from 1947 to 1979, particularly in Balochistan. That is important, because Balochistan occupies a pivotal position in bilateral relations, given the Baloch populations in both countries. Much changed with the Iranian revolution in 1979. The secular, pro-West Shah was ousted, and the Ayatollah Khomeni became the supreme leader of the Islamic Republic of Iran. In Pakistan, meanwhile, General Mohammad Zia-ul-Haq (1977-88), a staunch follower of the Sunni sect of Islam, was dictator. Consequently, a divide between the countries emerged, particularly as Iran sought to spread its revolution to Pakistan, which although a Sunni majority country is still home to a large Shia population. IN a subcontinent dominated by Pak-India conflicts, the short, sharp Sino-Indian war of 1962 remains rather neglected, with little analysis of how it helped shaped the region into what it is today. The recent standoff at the Doklam plateau, and the inevitable parallels that are being drawn, makes it worthwhile to take another look at this conflict. The road to the 1962 war starts in Tibet — in fact, it starts because of the road to Tibet. No sooner had Mao proclaimed the People’s Republic of China (PRC) in 1949 that troops were sent to conquer this land, via a road that passed from the western Chinese province of Xinjiang through Aksai Chin and on to Tibet. When a Tibetan uprising took place in 1959, this was again the route Chinese reinforcements took. The revolt failed and the Dalai Lama fled to India where he was granted asylum, much to China's chagrin. Soon after, India starts to strengthen its position along the McMahon line, the border between Indian and China. In particular it expanded its positions in Ladakh, which borders Aksai Chin. The Islamic State stands on the brink of a twin defeat. Mosul, the largest city under its control, has almost entirely fallen from its grasp, and Kurdish-led forces are advancing into its de facto capital of Raqqa. Now, as the saying goes, comes the hard part. The Islamic State’s territorial setbacks have introduced new questions about the basic future of the Middle East. Foreign Policy has assembled a group of policymakers and regional experts to answer them. That is an answer the United States should reject. Such a development would cement an anti-American coalition in place, threaten Jordan and Israel, and leave Iran the dominant power in much of the region. To reject this challenge verbally would be a joke, however; it must be resisted on the ground, through the use of force by a coalition that must be built and led by the United States. The conflict in Syria has destroyed any possibility of an easy formula for putting that country back together, but in the medium term, one can envision a discussion with Russia of how our interests and theirs can be accommodated while bringing the violence down to a level that allows many refugees to return home. But that discussion will achieve nothing unless American power first gains Russian respect and the Russians come to realize that compromise is necessary. Why Is Russia Denying That North Korea Launched an ICBM? North Korea definitely tested an ICBM on July 4, 2017, so why is Russia denying it did? The United States, Japan, South Korea, and North Korea all agree that, last week, North Korea successfully flight tested an intercontinental ballistic missile (ICBM) that it calls the Hwasong-14. A U.S. government source with knowledge of the Hwasong-14 launch confirmed to The Diplomat that the United States currently assesses the missile’s range as falling in the 7,500 to 9,500 kilometer range. The upper bound of that range would allow the Hwasong-14 to reach major U.S. cities on the country’s west coast, including Seattle, San Francisco, and Los Angeles. By any measure, this new North Korean missile qualifies for the ICBM label. However, this same missile, which the United States government has designated the KN-20, is not being assessed as an ICBM by Russia, which last week blocked the United Nations Security Council’s condemnation of North Korea on the grounds of its disagreement about the nature of the missile and its range. China, meanwhile, has “noted relevant reports” about the Hwasong-14 launch, but has not yet called it an ICBM publicly; Beijing is “trying to get more information,” according to its Foreign Ministry spokesperson. Are there grounds for reasonable doubt that North Korea launched an ICBM? Well, not quite. I want to spend a few minutes on the potential of AI—the way I see it. And let me tell you, it’s not in the future, it’s here and now. There is no point being an ostrich and burying our heads in the sand. 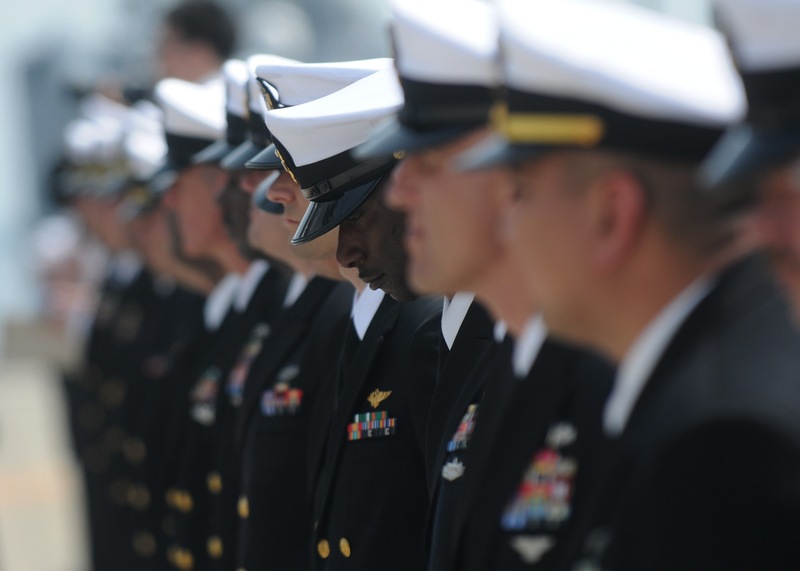 The diminishing numbers of those who serve should give pause to a country that prides itself on an ideal of “citizen soldiers.” Currently only .4% of the US population is serving in the military.2 The number of U.S. citizens who are veterans has also dropped significantly since 1980, when 18% of U.S. citizens were veterans. As of 2014, the number had dropped to 8% and is expected to continue its downward trend.3 Despite their starkness, the numbers alone represent only half of the equation. The other half is determining to what extent these warriors are representative of the population they serve. Do their values reflect or diverge from that of the population writ large? The question of who constitutes the members of this caste, how they lean politically and what they value is central for those who study American civil military relations. A Punisher unmanned ground vehicle follows a soldier during the PACMAN-I experiment in Hawaii. Imagine battles unfolding faster than the human mind can handle, with artificial intelligences choosing their tactics and targets largely on their own. The former four-star commander in Afghanistan, John Allen, and an artificial intelligence entrepreneur, Amir Husain, have teamed up to develop a concept for what they call “hyperwar,” rolled out in the July issue of Proceedings. It’s an intriguing take on the quest for the AI edge we here at Breaking Defense have called the War Algorithm — but their article leaves some crucial questions unanswered. So I spoke with both men (separately) to ask them: Is this a realistic vision, or does it ignore Clausewitzian constantslike fog of war and friction? What’s the place of humans in this future force? And, most urgently, does the sheer speed of hyperwar require us to delegate to robots the decisions about what human beings to kill? 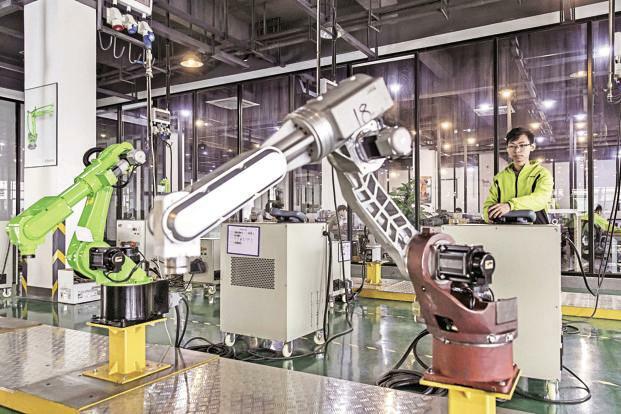 This Terminator Conundrum, as Joint Chiefs Vice-Chairman Paul Selva calls it, is so fraught that the previous Secretary of Defense, Ash Carter, said bluntly the US will “never” give autonomous systems authority to kill without human approval. It’s so fraught, in fact, that the two co-authors give distinctly different answers, albeit not incompatible ones. The Battle of Gettysburg was a turning point in the American Civil War, and Gen. George Pickett’s infantry charge on July 3, 1863, was the battle’s climax. Had the Confederate Army won, it could have continued its invasion of Union territory. Instead, the charge was repelled with heavy losses. This forced the Confederates to retreat south and end their summer campaign. Pickett’s Charge consequently became known as the Confederate “high water mark.” Countless books and movies tell its story. Tourists visit the battlefield, re-enactors refight the battle and Civil War roundtable groups discuss it. 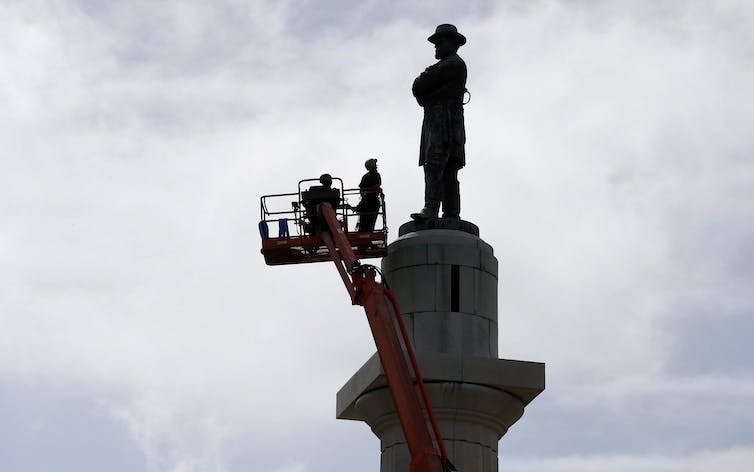 It still reverberates in ongoing American controversies over leaders statues, Confederate flags and civil rights. Why did the charge fail? Could it have worked if the commanders had made different decisions? Did the Confederate infantry pull back too soon? Should Gen. Robert E. Lee have put more soldiers into the charge? What if his staff had supplied more ammunition for the preceding artillery barrage? Was Gen. George Meade overly cautious in deploying his Union Army? Politicians and generals began debating those questions as soon as the battle ended. Historians and history buffs continue to do so today. The newest ransomware attack called NotPetya has re-ignited the debate ongoing since the earlier WannaCry attack. Cybersecurity experts, policymakers, and citizens affected have all asked: who is to blame for these attacks? The underlying vulnerability in both these attacks is based on a Microsoft vulnerability, which was discovered and extensively used by the National Security Agency, before being lost or stolen, and subsequently publicly released by the Shadow Brokers, a group thought to the connected to Russia. In that sense, this is undeniably NSA’s fault. If not for their finding the bug and developing this exploit, none of this would have happened in this way. But is this important? My colleagues in the cybersecurity community generally touch on six different and often overlapping centers of blame. One group blames companies for not patching the original NSA vulnerability, and they’re certainly not wrong. Enterprise IT teams have had months since the Microsoft patch, and on top of that, the scare from WannaCry to take care of this. No doubt, companies that focus on the basics like patching are less likely to be victims. Major General Thompson was recently appointed as the Deputy Chief Information Warfare for the Australian Defence Force. Tim Wilson, Editor-In-Chief of the cyber security website — DarkReading.com — had a July 6, 2017 article based on a survey of the Black Hat attendees on the eve of the 20th annual gathering (July 26/27) in Las Vegas, Nevada. My how things have changed. Twenty years ago, Black Hat was an obscure, mostly unknown, and small gathering of the world’s greatest White Hat hackers. A group of computer nerds, who knew that the Internet had serious security issues; and, they gathered once a year to sort of ‘shout in the digital wilderness’ about the latest hacking threats; and, to warn about where and how that threat might evolve in the coming months and year/s. From an eclectic, small group, Black Hat has evolved into an annual gathering of hundreds of the world’s most elite White Hat hackers, with thousands more following the conference via the worldwide web. These cyber white hatters, are the digital ‘good guys’ in the cyber hacking world, who seek to warn us about what they see as the latest, most creative, and devious ways that the digital bad guys, the cyber Black Hats, are attempting to breach our devices and networks. As those who have been invited to attend the 20th session later this month prepare to leave for Las Vegas, Mr. Wilson discusses a poll that was just completed, that asked the attendees how they thought the worldwide cyber threat is likely to evolve and play-out in the next twenty-four months. Here's another sign we're living in the future: For the first time in 70 years, the U.S. may add a new military branch—for space. The House Armed Services Committee voted last week to approve a proposal in the National Defense Authorization Act that would create the Space Corps, a military arm under the Air Force aimed at overseeing operations in space. The branch would mostly monitor assets like satellites and track cyber threats, Vox reported Wednesday. The concept of the Space Corps dates back to 2001, when then-Defense Secretary nominee Donald Rumsfeld called for more collaboration between agencies and the establishment of an undersecretary position focusing on space, intelligence and information. At the time, Rumsfeld said such action was necessary "if the U.S. is to avoid a 'space Pearl Harbor.'" But even though the idea may be old, the proposal is still causing controversy. Some Air Force officials oppose the Space Corps because of the organizational challenges it could create. Last week, a few of the committee members also raised concerns that they'd just learned about the plan and wanted it to be studied in detail, according to Federal News Radio. In May, a former NATO supreme commander urged the alliance to plan an offensive cyber policy to combat Russian information influence operations. Philip Breedlove was getting hacked by the Russians before it was cool. In 2016, the same group that penetrated the Democratic National Committee also stole the former supreme commander of NATO’s personal emails, and published them to a Kremlin-produced website called DC Leaks. Recently the Air Force general advocated for a strong alliance pushback on Russian cyber-influence operations. He says it must start with a strong NATO policy that would allow the alliance to conduct offensive cyber and information operations against Russia. His views contrast with those of President Donald Trump who, on the eve of his first meeting with Vladimir Putin, again refused to acknowledge the extent of the Kremlin’s actions aimed at the U.S. election and declined to voice support for tough measures. Speaking at a May security forum, Breedlove said that it was up to the U.S. and NATO to hold Russia accountable for its actions, and that accountability should take the form of offensive cyber and information attacks. “We in NATO have incredible cyber capability. But we in NATO do not have an incredible cyber policy. In fact, our policy is quite limiting. It really does not allow us to consider offensive operatives as an alliance in cyber,” he said. These are still early days of EV and battery storage revolution. But it would seem like the stars are finally aligning to increase the pace of change. A dream you dream alone is only a dream. A dream you dream together is reality – said the Japanese artist Yoko Ono. A world with controlled carbon emissions is a dream which has been dreamt by many. Individual dreams and government policies to promote non-polluting sources of energy or mobility have frequently been sacrificed at the altar of budget constraints, difficulty to scale solutions, or simple consumerism. A few disconnected events taking place across the world in the last few days however should make as pause and think – is the inflexion point here? Electric vehicles (EVs) have been available in some form or the other for a couple of decades now. They are only just beginning to catch up on volumes. Yet, difficulties abound when it comes to mass adoption. Battery storage is another area where rapid progress can promote renewable power generation as well as longer-range EVs. The disconnected events may foretell good news on both these fronts.